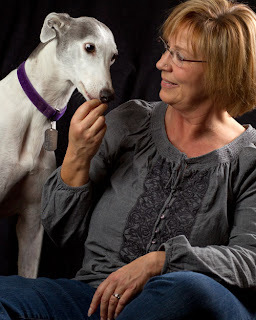 My name is Terri Jacobson and I am one of the servants at Greyhound Gardens. By day I am a graphic designer at a community college, by night I take photos and everything in between I spend with the dogs. The greyhound snagging the treat out of my hand is Minnie. She’s eight years old and is one of the spunky ladies that keeps the rest of the hounds in line. My partner Karen and I actually have coffee twice a day, every day with the hounds. Our back patio overlooks a fenced acre and we spend an hour every morning and an hour every evening out on the patio having coffee. Fresh ground and home brewed, strong with a splash of cream. 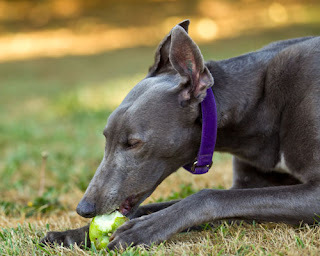 During the summer months, the dogs love to eat the fresh fruits, cherries, plums and apples as they ripen on the trees. They have also discovered bully stix, they are a coveted favorite. I’ve been involved in greyhound adoption for a long time. Some of our hounds we adopted because they were seniors or shy or had other issues that made it harder for them to be adopted. Minnie was three months old when we met her at a greyhound farm. I really wanted to see what the racing side was like, so we bought her and her half-brother Flocko [photo left] as puppies to follow them through their careers. When they retired, we brought them home to be our pets. 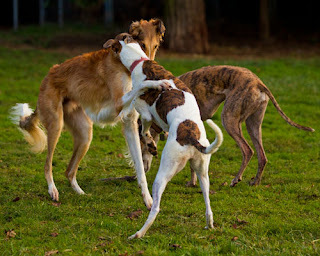 Timber [photo right] is a fluffy greyhound, a borzoi. He was a complete surprise for us. A friend of ours knew the family that had Timber and the allergies had kicked into full swing with a borzoi. In November 2011 he called and asked if we would be interested. 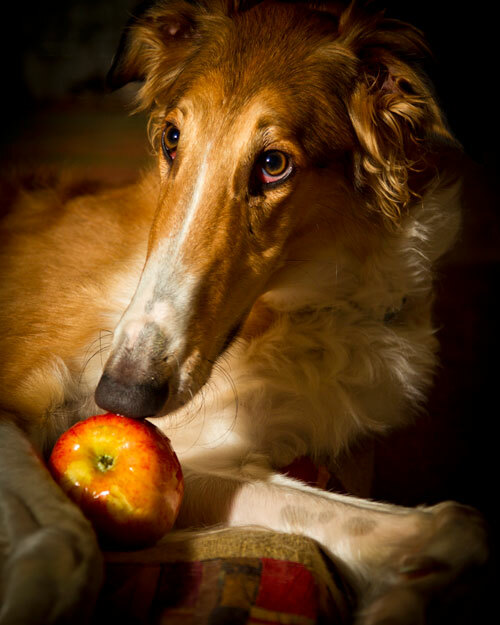 I thought for sure that our friend was kidding, who would give up a one-year old borzoi? Two weeks he called me back and asked if we’d thought about it. He gently reminded me that most of our pack was getting older and it might be nice for us to have a younger dog around. Enter the borzoi at Greyhound Gardens. When Mickey was born, the kennel owner called me because she knew I had a secret obsession for white and black dogs. Mickey was two days old when we held him for the first time. I think I may have named him Mickey so that I would have “Mickey and Minnie.” He came home from the track only having raced once or twice. Any nicknames? Most of the greyhounds kept their kennel names when we adopted them. We named Talley after one of our veterinarians, we got to name Minnie and Mickey when they were pups. They all have nicknames and a song to go with their name. You've got some beautiful photos on your website. What's the biggest challenge in shooting dogs? My hope is to someday become a pet photographer. The more photos I take of the dogs, the more challenges I encounter. The natural light outside is rarely perfect. Most of the time I am either fighting direct harsh sunlight or because we live in Oregon, I deal with a lot of really flat, overcast skies. I’m an eye person, so if the eyes are perfectly focused with a highlight, the photo rarely makes the first cut. I’ve dumped a lot of great action shots just because of the eyes. Do your dogs have a favorite place to go for walk? Anywhere with a leash attached is a favorite place to walk. Since photography is my second passion after the dogs, nearly every week-end we take one dog on an adventure. Sometimes we go to the beach, sometimes we hike in the mountains and sometimes we just go for a drive to see where we end up. Surely you jest, the squirrels drive the dogs crazy. Our property is surrounded by tall cedar trees, perfect squirrel villas. We used to have a significantly large population of feral cats, but I think they all got the memo and no longer come around. Or, they have each other to chase around. Squeaky toys rule for most of the dogs. Flocko lives to play with his ball and Timber is quite the tug-o’-war king. Definitely, without a doubt quit the day job and get a bigger bed. 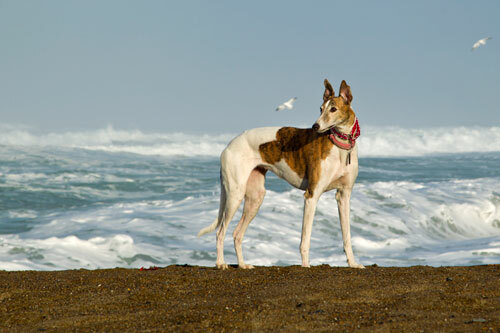 If your dogs could change one thing about being Oregonians, what would it be? Actually, I think being Oregonians suits us perfectly. The occasionally potty break out in the rain is not always welcome, but the standing water afterwards is a favorite to run through. The temperature is almost always livable. We are only an hour from the coast and an hour from the mountains. It’s perfect. You live in a multi-hound household and that isn’t going to change. We’ve given each of you your own cushions, kennels and bowls. We’re always available for ear scritches. What else do you want from us to make this the best life ever? Visit the websites for Greyhound Gardens and Terri Jacobson Photography & Design. 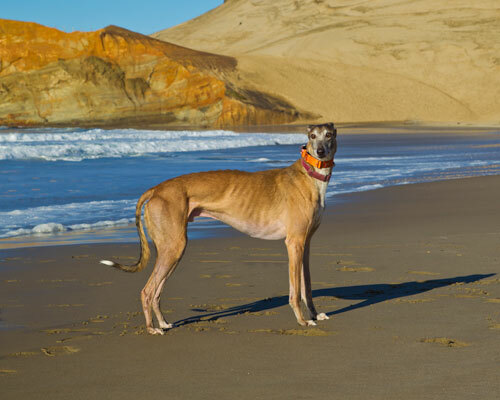 Terri has such beautiful greyhounds. I do seem to have a soft spot for Timber, though! Greyt interview! I love Terri's blog and all the hounds. Great interview.